A couple months ago, I received a package in the mail from my friend Adam. 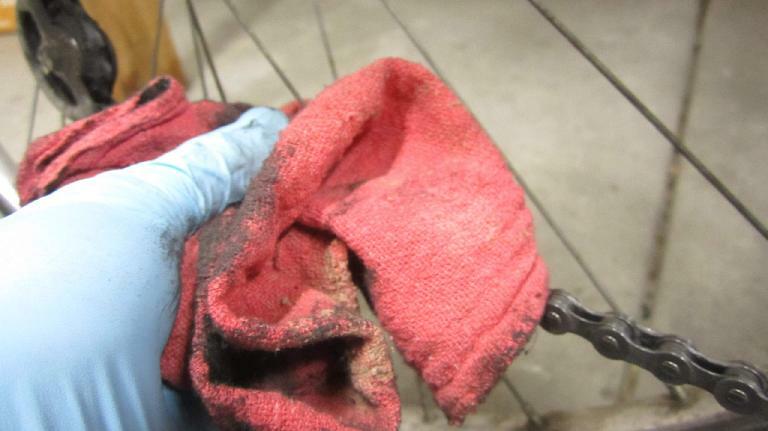 It consisted of a blue, fist-sized, plastic contraption that “cleans and lubricates (bicycle) chains” and was created by an inventor he met on an airplane last year. Adam rightfully thought I’d be interested in using it, and I promised I’d test it out. Here is the review. The product is called the Z Chain Oiler, which is probably not the best name for it. 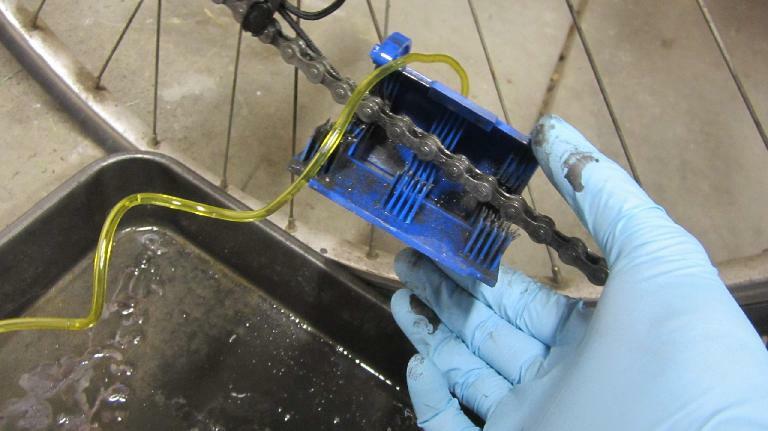 This is because the vast majority of chain lubricants people use come in a drip applicator, and you absolutely do not need this product to drip lubricant onto the links of a chain. 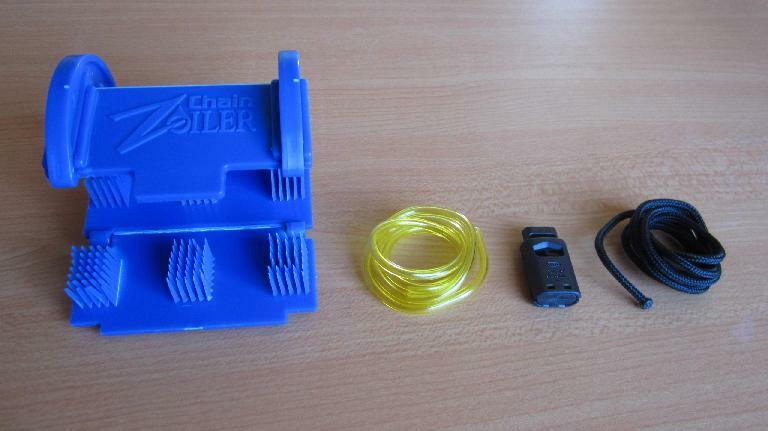 Perhaps by having the Z Chain Oiler attached while dripping lubricant, the device helps work the lube into the chain? 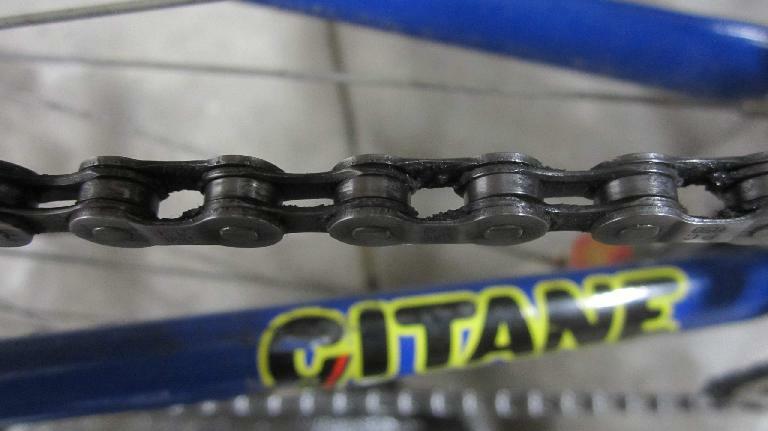 But merely rotating the crankset counter-clockwise while lubing the chain will accomplish that. I wouldn’t bother attaching the Z Chain Oiler for that purpose. The device may have some value in applying a spray lubricant, as its body enshrouds the chain and keeps errant overspray away from the bicycle frame. But it is preferable to drip—as opposed to spray—lubricant onto the chain links in order to prevent excess lubricant from getting onto the sides of the chain links. The product consists of a plastic body with interior scrub brushes, flexible tubing, string, and a drawstring cincher. The latter three items are not visible from looking at the unopened package, leading me to initially think that they were missing. In fact, after opening the package, I discovered they were neatly hidden inside the plastic body. The package says the Z Chain Oiler is made in the U.S.A., and its company (Fanaf LLC) is located in Durham, California. 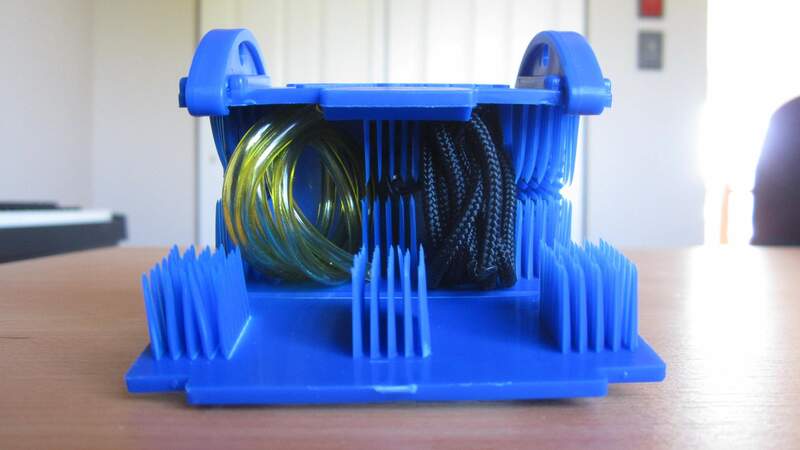 The blue body is made of a hard plastic that doesn’t look particularly durable at the flexible seams, but considering most people aren’t likely to clean their chains more than a few times a year, it is probably durable enough for years of use. This requirement, unfortunately, is one of the reasons it took me so long to do this review: I had to obtain an aerosol degreaser! Degreasers such as Simple Green or Natural Orange are readily available in any supermarket, department store, hardware store, dollar store, and auto store, but in pump bottles only. I know because I looked in those stores first while shopping for other things. To find an aerosol degreaser, then, I had to make a special trip to a bicycle shop. Ultimately, I picked up a can of White Lightning Clean Streak, which was the least expensive degreaser (along with another made by Finish Line Speed Degreaser sold at Performance. At $10 per can, it is a bit more expensive than the pump-spray degreasers you can find for $1-6 at the other places I mentioned. After I picked up the can of White Lightning degreaser, I found the Z Chain Oiler easy to set up. 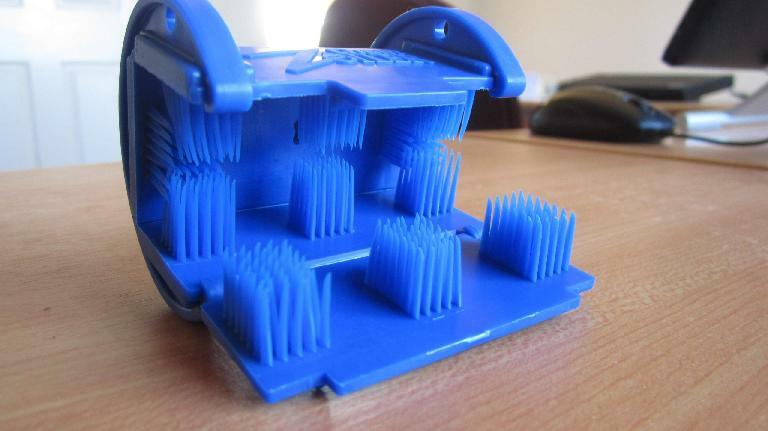 Unfold the bottom flap from the blue plastic body, and “wrap” the device around the chain. Refold the bottom flap. Wrap the string around the rear quick release and along the back of the rear derailleur, as depicted on the back of the package. Attach the straw that came with the aerosol degreaser to the aerosol can, and then the straw to the tube. Rotate the bicycle crank backwards (counter-clockwise) while intermittently or simultaneously pressing the spray button on the aerosol can. 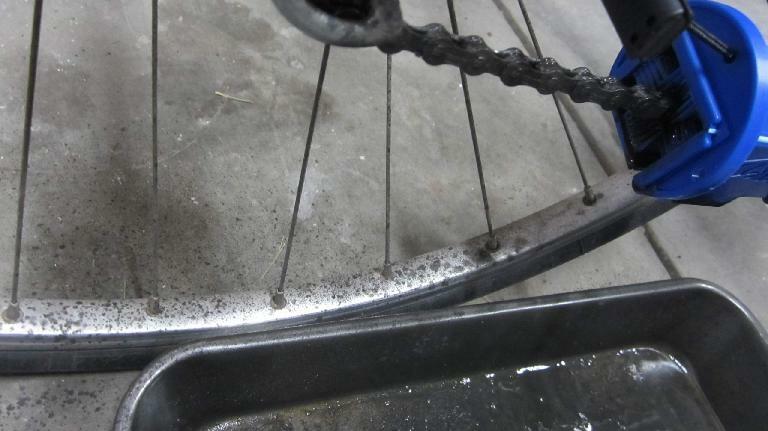 So how well did the Z Chain Oiler plus White Lightning Clean Streak clean the chain? Short answer: not very well. 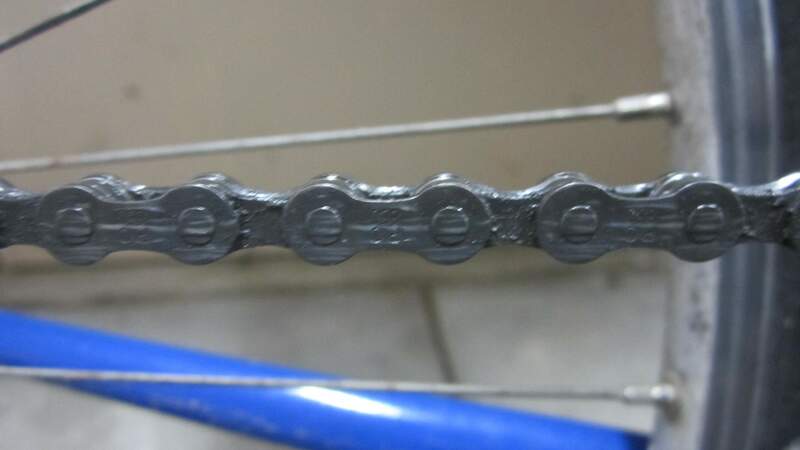 Thus, I still had to use a rag to wipe off the chain after disconnecting the Z Chain Oiler. It appears that even while continuously spraying the degreaser onto the chain while using the Z Chain Oiler, there was not enough liquid flow to wash away the interior grit. Continuous spraying while rotating the crankset caused another problem too: splashing. You can see how much oily substances were splashed onto the rear wheel and floor in the photo below. As much as I wanted to like this product, I can’t recommend it for the following reasons: 1) it requires an expensive aerosol cleaner, 2) it splashes onto the rear wheel, 3) it is a little unwieldy to use unless the bicycle is secured onto a workstand or trainer, and 4) it doesn’t clean the chain very well. I prefer to simply remove the chain (a $1-3 bicycle chain master link makes this easy without tools), throw it in an old baking tray with lots of cheap degreaser, scrub it with a discarded toothbrush, swish it around, and then wipe it off with a rag. Lube and done. 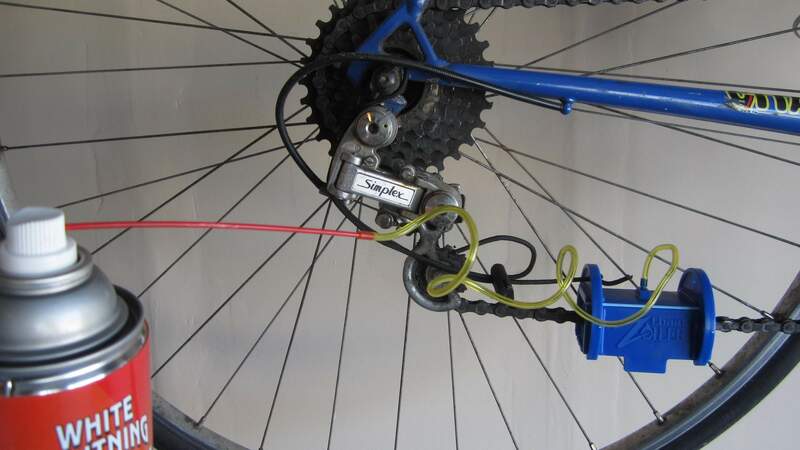 Other cyclists do a variation of the above, which is to remove the chain, throw it in an old coffee can with a lot of gasoline, and swish it around. Having lots of fluid, it seems, is the key to removal of the interior chain grit that the Z Chain Oiler fails to remove. 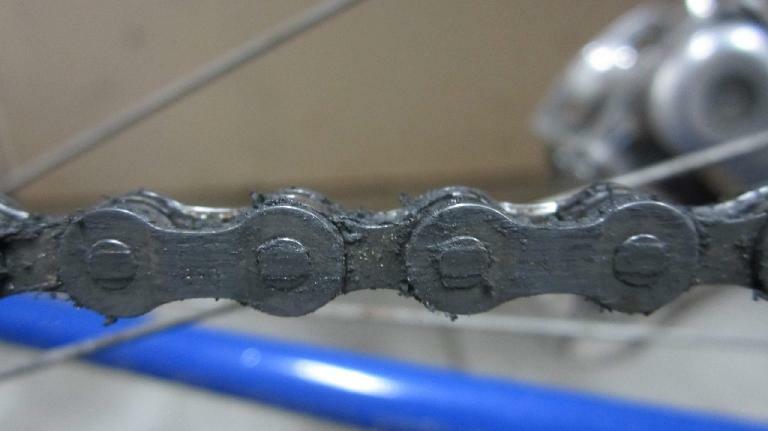 Of course, with the waxed chain method for lubrication, I have found that I never even need to clean my chains as they do not accumulate oil and grit. Plus my chains stay quiet for 300 miles. 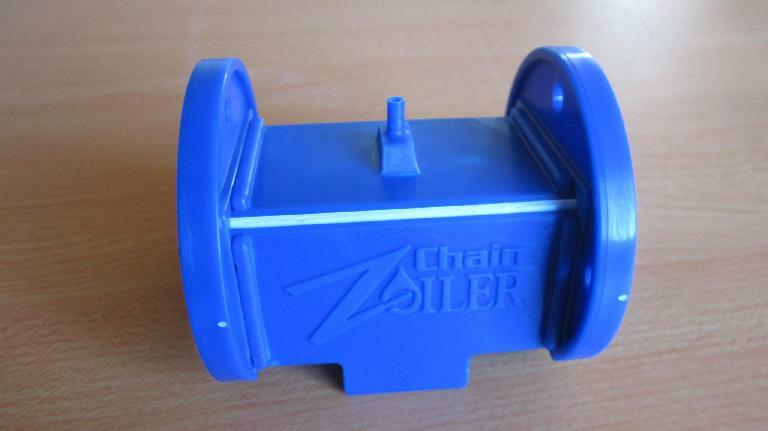 It’s probably just as well, then, that the Z Chain Oiler doesn’t even seem to be sold anymore. The back of the package lists a syntactically incorrect URL of http://zchainoiler/cybertyz.com, and the first page of a Bing search doesn’t return any valid retailers. 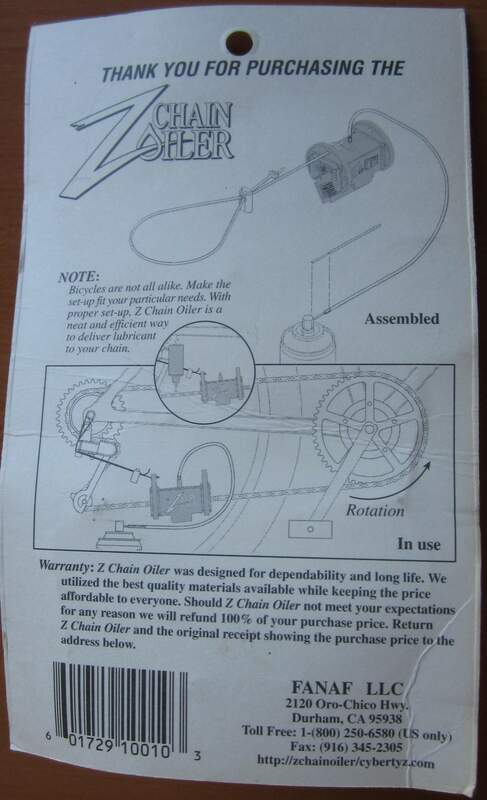 A variation of the Z Chain Oiler, however, for motorcycles is listed on eBay at the time of this writing. The listing I found had it priced at $8. 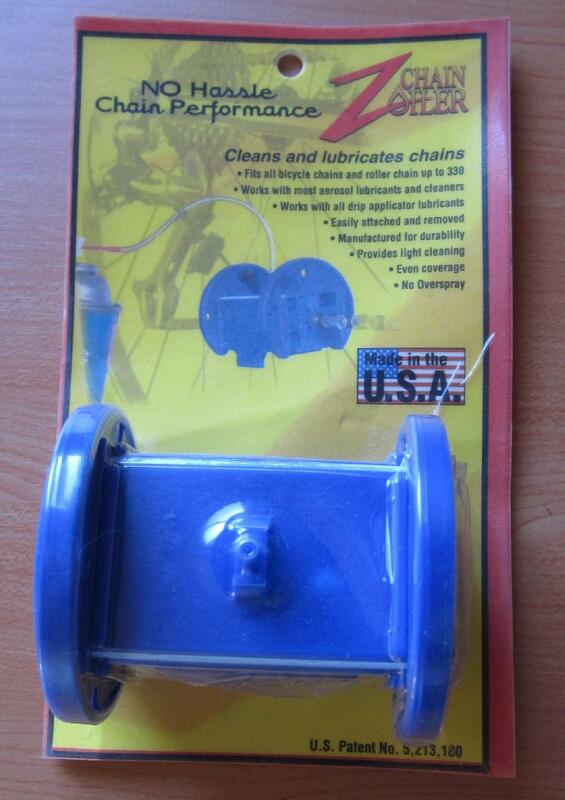 An on-the-bike chain cleaner may actually be worth that price for motorcycles since, I imagine, it is much more troublesome to remove a chain from motorcycles than from bicycles. Unfortunately, this is not the device to provide “no hassle chain performance” despite what the package claims. Boy, I hadn’t heard about the gasoline method of cleaning chains. That looks really inadvisable to me–too much risk involved.